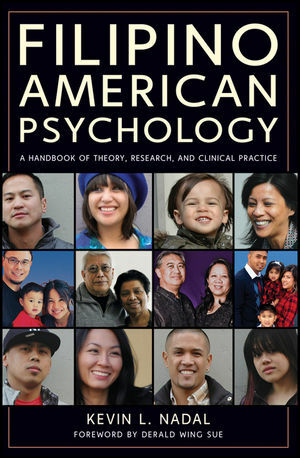 "Filipino American Psychology: A Handbook of Theory, Research, and Clinical Practice is destined to make a major contribution to the field of Asian American psychology and to the larger field of multicultural psychology." "Dr. Nadal has done a superb job of locating the experiences of Filipino Americans within the larger scholarship on ethnic minority psychology, while also highlighting the complexity, richness, and uniqueness of their psychological experiences. This book should be a part of everyone's library." "Ranging from historical contexts to present-day case studies, theoretical models to empirical findings, self-reflection activities to online and media resources, Filipino American Psychology will engage, stimulate, and challenge both novices and experts. Without question, Dr. Nadal's book is a foundational text and a one-stop resource for both the Filipino American community and the community of mental health professionals." Addressing the mental health needs of the Filipino American population—an often invisible, misunderstood, and forgotten group—Filipino American Psychology provides counselors and other mental health practitioners with the knowledge, awareness, and skills they can use to become effective and culturally competent when working with their Filipino American clients. Filipino American Psychology begins by looking at the unique cultural, social, political, economic, and mental health needs of Filipino Americans. Noted expert—and Filipino American—Kevin Nadal builds on a foundational understanding of the unique role and experience of Filipino Americans, offering strategies for more effective clinical work with Filipino Americans in a variety of settings. A must-read for mental health professionals as well as educators and students in the mental health field, Filipino American Psychology is an insightful look at the Filipino American community and the nuances of the Filipino American psyche. Kevin L. Nadal is Assistant Professor in the Department of Psychology at the John Jay College of Criminal Justice where he also serves as the Deputy Director of the Forensic Mental Health Counseling graduate program. Dr. Nadal's research has focused primarily on multicultural issues in psychology, including impacts of racial discrimination and racial/ethnic/sexual identity development on mental health.